Includes 30 Day Risk Free Trial. Enter Coupon Code: "aprilpromo5" at check-out to save 5% and also receive FREE Travel Bidet and TWO (2) FREE Carbon Water Filters. The Blooming NB-R1063 provides a comfortable cleaning as it cleanses you with a gentle aerated water wash. Use the convenient remote control to adjust nozzle position, water pressure, and water temperature until it feels comfortable. The LED night light is well designed and illuminates the toilet with a warm glow. This model is designed to fit virtually any toilet in the world, including those hard-to-fit one piece toilets. Upgraded to include an on-demand water heater, you will enjoy a continuous warm water wash. It also comes with a temperature controlled, heated seat and had the strongest air dry feature of the units we tested. Built-in massage and water pulsation are some of the other features this model has to offer. With a soft closing seat and lid, and a power saving mode that minimizes energy consumption, this is a feature-packed seat your whole family can enjoy. 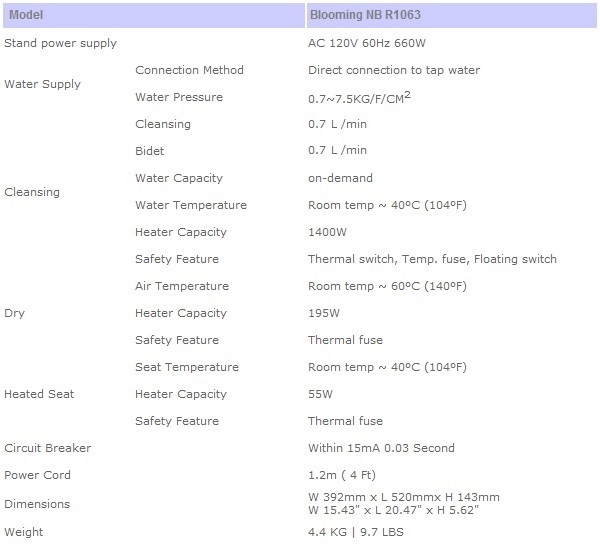 The Blooming NB-R1063 is very well constructed and has all the features you would expect in a bidet seat of this class. What makes this model unique, is that not only does it fit two piece toilets, it even fits those hard-to-fit one piece toilets too (including those with French curve). Another unique feature is the addition of a night light, which isn't available on most other models. You can read our offical review on this model here: bidetsPLUS' Blooming NB-R1063 Review, but we also wanted to provide some quick thoughts below. Everything the Blooming NB-R1063 does, it does well. Seriously. As one of the best bidet seats in our store, it is very well designed and attention has been given to every detail. For example, even the wash nozzle has been specially treated with a germ-resistant coating. Wash features include both posterior and frontal wash functions. Wash settings can be customized as well – water pressure, water temperature, and the position of the wash nozzle on this seat can all be adjusted. 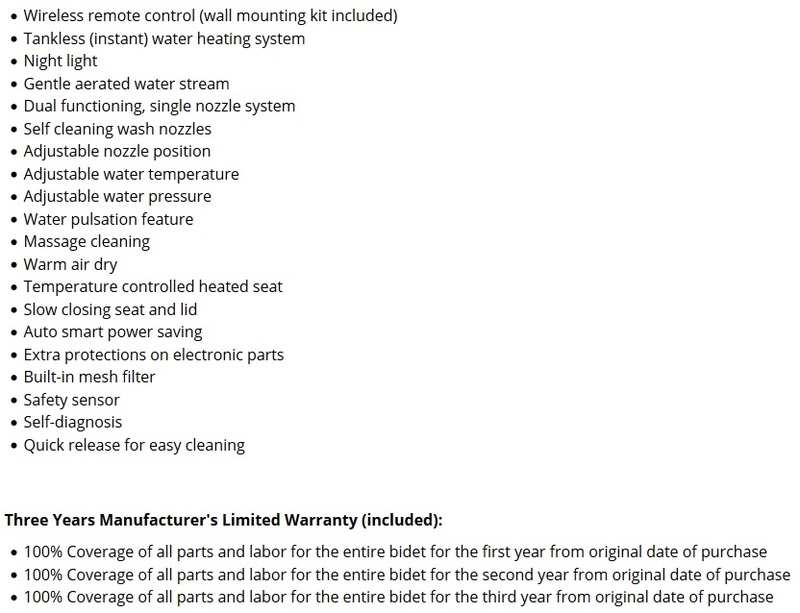 And compared to reservoir tank heaters that have a limited supply of warm water, the new on-demand water heater in this bidet seat provides never ending warm water. Operated with a wireless remote control, the remote control is the most compact we’ve seen – measuring just two inches wide and five and a half inches tall. This makes it really easy to use in one hand. All buttons on the remote are clearly labeled and we found it pretty intuitive. There’s also an LCD screen on the remote which indicates which of the features are being used, and under which setting. For example, if the water pressure is on the highest setting, the LCD screen will display that. Non-wash features include a warmed toilet seat, slow closing seat and lid, and warm air dry. Some things to highlight here – the warm air dry for the Blooming NB-R1063 is one of the strongest out of all the models we tested (it has a very strong air dry fan inside it). And as mentioned previously, the Blooming NB-R1063 also features a convenient LED night light, which illuminates the entire toilet bowl. A very handy feature when using the toilet late at night. For a more detailed review on this model, check out our Blooming NB-R1063 Review page. You should also watch our exclusive bidetsPLUS video review of this Blooming seat. 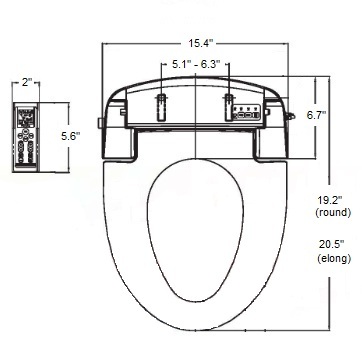 It provides a great overview of all the features you’ll find in this great bidet toilet seat! I have one of those one-piece toilets where the water tank is curved around the back making other bidets impossible to fit. I really didn't want to change my toilet so I called bidetsPlus to see if one of their models would fit. They recommended the Blooming NBR1063 and said I could return it if it didn't work and sure enough, it fit! But I must say - even if had a different toilet, I would still get the Blooming now that I've had a chance to try it. You still get all the spray features + adjustability and the newer tankless water heating system. The seat is heated and you get an air dryer which has a nice, strong fan. The night light is a bonus too. Great design. Fits all toilets! This product works great. We have bidets in my country, but this is the first time to use a bidet that is built into the toilet seat. Much more convenient and my family likes it very much. I am very happy with the product. One criticism, though minor. The drying unit is off to the side and I wish it were more centered. But that aside, I am very pleased with the performance of the unit. Well-built bidet seat, works great! We ordered the Blooming 1060 and it's turned out to be one of the best things we've ever added to our home! The bidet washes you comfortably and effectively and now that I have it, I wonder how/why I used toilet paper for so long. The night light is really great when you have to "go" in the middle of the night, and the heated toilet seat is fantastic. This is our first bidet seat so can't really compare it to others, but we are very pleased with the unit and it suits all our needs.